Apple today seeded the second beta of an upcoming macOS High Sierra 10.13.5 update to developers, two weeks after seeding the first beta and three weeks after releasing the macOS High Sierra 10.13.4 update. The new macOS High Sierra 10.13.5 beta can be downloaded through Apple Developer Center or the Software Update mechanism in the Mac App Store with the proper profile installed. macOS High Sierra 10.13.5 introduces support for Messages on iCloud, a feature that was previously present in macOS High Sierra 10.13.4 betas before being pulled ahead of the release of the update. Messages on iCloud is also available in iOS 11.4. The update also likely includes bug fixes and performance improvements for issues that weren't addressed in macOS High Sierra 10.13.4, but as Apple does not provide detailed release notes for macOS High Sierra updates, we may not know exactly what's included until the new software is provided to the public. 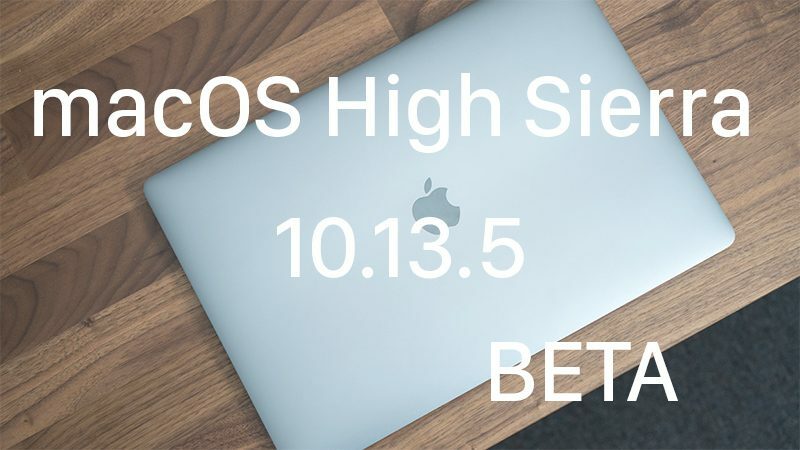 No major outward-facing changes were found in the first beta of macOS High Sierra 10.13.5, but we'll update this post should any new features be found in the second. The previous macOS High Sierra 10.13.4 update brought support for external graphics processors (eGPUs) along with Business Chat in Messages and several other bug fixes and smaller feature improvements. I wish they would post the areas of focus on these like they used to. Worth the update from Sierra, or still have issues? My thoughts exactly. Running an old mid-2010 MacPro 12-core, with an SSD plus two HDs for storage and backups. All apps behaving themselves, pretty much, with an Nvidia GTX980Ti GPU. I'm usually all over OS upgrades, but this one seems a bit dodgy for older machines. Do the benefits outweigh the risk? It's a beta. The second beta. Of course it has issues. If you realy want to upgrade from Sierra to High Sierra, upgrade to the latest stable version MacOS 10.13.4. I'm not upgrading until they let me use Nvidia cards in my eGPU. This feud of theirs is hurting me as an artist and it makes me real mad. They are.. Yet more iOS stuff with extra Cringemoji. 10.13.4 had a major issue with multiple display support, and it’s rendered Duet Display for my iPad Pro unusable. The Duet support guy admitted that it broke because Apple hardcoded the resolutions in 13.4, which their team now is (unsuccessfully so far) trying to fix. Apple support of course is mum on this, and Duet cannot give an ETA for a fix. I haven’t been so frustrated about something so seemingly basic in a long time. iCloud Messages can wait IMHO, as long as Apple does some SERIOUS debugging on their trainwreck OS and stop “fixing” things that aren’t broken. Nvidia is so behind in this they tried some PR stating their partner as an Russian hack company (Bizon). Stop blaming Apple, Nvidia drivers are terrible. In many test Vega is faster than 1080ti and at least it has pretty nice mscOS drivers, Cook OpenCL and Metal performance. Can anyone confirm if this fixes the DisplayLink issues? My wife just got a new macbook for work and cannot use an external monitor due to these issues. It's really effecting her work. why does everyone assume it's Apples fault when it comes to Nvidia. Nvidia has been the ones playing the hardball with Apple. even the pc people/mfgrs know they are asses. but gamers spill tears on tears. get ready to cry more. Nvid are and have been backing themselves into a corner with a few devs. Seen it before. ABOBE shitshills and a few high end devs of 3d softs. others are catching up fast. so the cashing in is what it is for now. If the DL people were using illegal interfaces then that's one thing but they're not. Except they are. DisplayLink is using kernel extensions for their software to work. Same goes for Duet. Apple has never supported and encouraged the use of 3rd party kernel extensions and has always warned it could potentially impact stability of the OS. In fact, there's a high probability that macOS 10.14 won't allow kernel extensions at all anymore, unless signed by Apple. So there's a large list of vendors who have some work to do if they want to have their software work in future macOS versions.